blasters for the fall 2001 Nerfing season. Hey everyone - just a quick note to say that TeamNC is still alive and well, and although we're no longer updating NerfCenter, we still appreciate all those who are still visiting this site and all of the many great Nerf sites that have stepped in to keep the online Nerf community going. We've moved servers a few times and plan to keep NerfCenter online as a reference for all those great legacy blasters that made up our childhoods. We also took the opportunity to clean up some of the lingering bugs that were left on NerfCenter. NerfCenter, believe it or not, was first published 18 years ago. While a lot of time has gone by, it still remains "Nerf or Nothing." Larami has revealed details about its new fall 2001 Nerf product line. 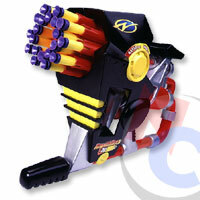 Click above for more information about the new blasters. With the recent closing of OddzOn, Larami Limited is now in control of the entire Nerf product line. Click above for more information about your favorite Super Soaker-producing company. Our previews section has returned in full force, sporting a brand new layout and appearance. In addition, we've got previews for all the interesting new Nerf blasters Larami has in store for Summer and Fall, 2001. Click above to take a look. Did Someone Ask for Reviews? Our review database increases in leaps and bounds as we add reviews of 14 new blasters, including the newest offerings from Larami, the Nerf Arrow Strike and the Nerf Blast Fire. In addition, all 14 new reviews are offered in all of the goodness of the new multi-review format, which includes new stats and a nifty new design. As an added bonus, we even review the long-lost 1994 edition of the Nerf Switchfire. Don't say that we don't love you guys. We're trying to get our links database current. If you have a Nerf site which still isn't listed in our links database, please e-mail us at Links@NerfCenter.com. NerfCenter is one of the first online Nerf references and was first published in 1999. Although it is no longer actively updated, it still remains a great reference for older blasters. NerfCenter respects your privacy. Please read our privacy statement for more information. Got some free time, or about to e-mail us with a question? Read our FAQ page first! Comments, questions, cash donations, and such are welcome. Please remember that we are not the official Nerf site. We do not make or directly sell Nerf products ourselves. See the contact page for information regarding contacting the proper toy manufacturers. NerfCenter has been visited by over a million unique visitors since June 6, 1999. Thanks for your continued support. Site Design Copyright ©1999-2017 TeamNC. Legal Quickies: (By visiting NerfCenter, you are agreeing to all of the terms detailed on the Legal Stuff page.) This is a privately designed web site, produced and published by TeamNC. This site is an unofficial Nerf® web site. None of the reviews on this web site reflect the opinions of Hasbro, Inc. No one on TeamNC works for Nerf® or any affiliated companies, and TeamNC claims no ownership of the weapons or their respective trademarks(® and ) featured on this site. TeamNC does retain copyright over the pictures and review data found on this site, however. Please contact us before using any of our work.